The Hitachi EUB-405 Plus is a portable, multi-purpose ultrasound designed for versatile usage and easy operation. This ultrasound is lightweight and the ultrasound is easy to move from patient to patient. 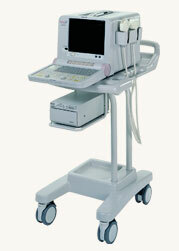 The Hitachi EUB-405 Plus ultrasound is suitable for cardiac, vascular, and OB/GYN applications. The EUB-405 Plus ultrasound’s keyboard is surprisingly easy to operate and it includes a 9-inch monitor. This ultrasound is also capable of connecting high-density multi-element probes, helping to provide sharp images and better resolution while also incorporating high-definition ultrasound conversion technologies.